Hi my name is Martin and I am artist and author, see my artist-hompage / Kunst-Homepage (german). My goal is to create pictures and / or to explain content in a clear and simple way. For this I create some infographics and web-projects. Please click here to see the actual infographic "How Google Glass works". Beside my german website "Brillen & Sehhilfen", where "glasses" are focused, I work on a project called "sehtestbilder.de". This is about visual eye tests and optical illusions. Since more than 20 years I paint picture that looks like visual eye tests. The whole project is only in german. Please try a translation machine to read more. I made some other infografics, but only for german. But I hope you understand it anyway. 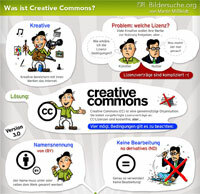 Infographic about "What is creative commons?" (german). It shows in a simple way why creative commons is a great concept. But it doen't mean "without condition". Usually you have to mention the author, and most times there are other points to think about. I paint a lot of digital stuff, and sometimes I record the painting process. Please find here my "speedpainting-videos" on youtube. I rendered out most vidos in HD-quality, you can find them on this channel. Because many people asked me for tutorials and infos about the way I paint digital I made a project about "Digital painting", called "Zeichnen am PC". I realize my infographics with Adobe Photoshop and a Wacom Intuos graphic tablet. I offer my services with my company DUPLICON. My Infographic "What glasses (for woman)?"